Distressed Debt Investing: Patriot Coal Bankruptcy: Hidden Value for the 8.25% Guaranteed Notes? Patriot Coal Bankruptcy: Hidden Value for the 8.25% Guaranteed Notes? Yesterday, I introduced readers to the Patriot Coal bankruptcy. More information continues to hit the docket. With this post, I am trying something new with the blog by introducing something I do not believe the market has caught on to and asking for feedback from readers (you can email me at hunter [at] distressed-debt-investing.com). Let me warn you this post may get messy and technical, but I think its an interesting and less talked about concept as it relates to the valuation of Patriot Coal's guaranteed bonds (8.25% of 2018 trading at 36.5-37.5). 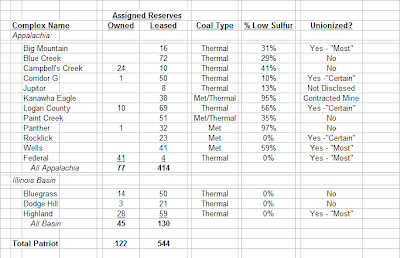 Starting on page 108 of this document (First Day Affidavit), Patriot Coal lays out each of its assets, breaking down owned versus leased tons of coal, per LLC entity (in this post I'll call this Exhibit the "LLC Document". Footnote 1 here states: "Assigned reserves represent recoverable coal reserves that we have committed to mine at locations operating as of December 31, 2011. Unassigned reserves would require new mine development, mining equipment or plant facilities before operations could begin on the property." Assigned reserves then should have more value then unassigned reserves (Patriot lists 666M tons of assigned reserves vs 1,265M of unassigned reserves). According to the LLC document in the First Day Affidavit, which corresponds to the 10K filing, there are 678M of owned reserves and 1,253M of leased reserves. The LLC Document in the First Day Affidavit breaks down each LLC into an individual reserve area and geographic location (county and state). So for example, Central States Coal Res. 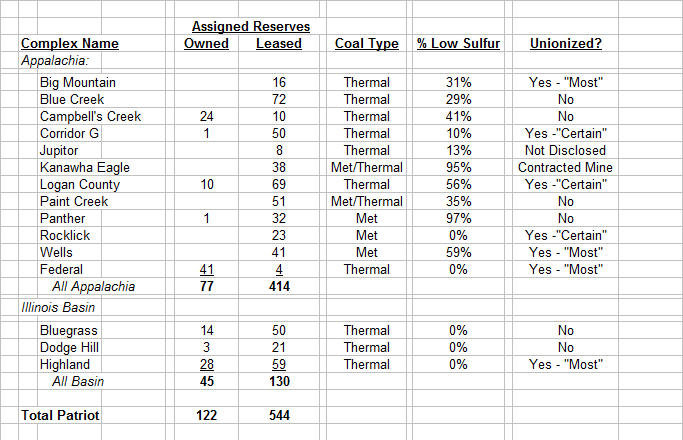 of KY, LLC has 7 distinct reserve areas representing ~146M of owned coal and 153M of leased coal. And if you are looking for the breakdown of Patriot vs Magnum Coal subsidiaries (Patriot made a large acquisition of Magnum Coal in July 2008), it can be found here: Patriot vs Magnum Subs. The point to remember from this paragraph is each mine has its own LLC. You will note I have only listed assigned reserves on this chart. Each of the listed entities have unassigned reserves (proven and probable) which require more development, though I still have not found a good breakdown other than the LLC document which requires some guess work on tie-ins. With that said, unassigned reserves do have value. And for my reference, of the exclusive met mines, Panther is lower quality met coal (high-vol B met coal), Rocklick and Wells are high-vol A. Kanawha Eagle is also high-vol B. This is where things start to get a little technical. As you can see in the above chart, I have listed whether a complex was unionized or not and the disclosure of percentage of union members. In the First Day Affidavit, CFO Mark Schroeder notes: "Approximately 42% of these employees are unionized and are represented by the United Mine Workers of America (the “UMWA”) under collective bargaining agreements." The 42% is off of the 4,000 people in active status. This is relative to PCX providing "healthcare and other benefits to 10,286 primary insureds and 12,145 beneficiaries, amounting to a total of 22,431 individuals covered by the Debtors’ benefit plans." From here we need to make the distinction between post-retirement healthcare benefits and pensions. This is an important distinction. In Patriot's case, the bulk of the legacy liabilities are post-retirement healthcare benefits. We now need to defined "Control Group Liability" which, under ERISA, means a plan sponsor and each corporation under control by that plan sponsor. If we were talking legacy liabilities in terms of pensions at Patriot (there are multi-employer pensions at Patriot), each mine listed above would be jointly responsible in a distressed termination of the pension and privy to rejection claims. But that's not what is happening here. Under Section 1114 of the Bankruptcy Code, a debtor in possession can modify retiree benefits. A question then arises if retiree benefits have vested or not. If not vested, claims do not arise. If vested, claims do arise as an unsecured claim for damages as a result of modification or termination. While there is some issues with PCX specifically as it relates to collective bargaining agreements with UMWA and how Section 1113 comes into play, that is for another post. We do not yet have a break down of vested versus unvested. We know the 8.25% bonds are guaranteed by "substantially all of the Debtor subsidiaries of Patriot Coal." The prospectus lists the guarantors which matches pretty well with the list of filing entities. When I first looked at Patriot's guaranteed bonds I assumed they would be pari with claims arising under 1114 of the Bankruptcy code due to changes they expect to make with the post-retirement obligations. But now I think that's wrong. I now believe the guaranteed bonds will be ahead of the damage claims (but still behind any priority claim which now includes a large DIP) in the mines / mining operations of non-unionized work forces (per each individual LLC). These complexes include Blue Creek, Campbell's Creek, Paint Creek, Panther, Bluegrass and Dodge Hill. So bond holders will really have two sources of value: 1) The value of the mines that are not burdened by post retirement liabilities - this value will flow exclusively to the guaranteed bonds after fulfilling DIP claims 2) The value of the mines that do have post retirement damage claims - this value will be shared with the larger claims pool. The mines probably do have SOME post retirement liabilities but until we see the schedules, its impossible to determine the real number. A caveat here is that this perceived 'seniority' would go away if Patriot sold these non-unionized mines piecemeal to pay down the DIP.You'd then be in the same spot you were before. But to the extent there is residual value after DIP and admin claims, I believe you will be ahead of the post retirement damages. And I couldn't write this post without mentioning the ruling in the Third Circuit in Visteon. I do not think anyone really follows that decision so I do not believe it will come into play here. I plan on exploring pensions and post retirement liabilities much more in depth in the future with our team of legal writers. Given that just in the past 48 hours we've seen adversary proceedings in both Eastman Kodak and AMR as it relates to these subjects, I think its topical to say the least. In meantime, if you have any thoughts on the above post, please shoot me an email or write in comments below. "Under Section 1114 of the Bankruptcy Code, a debtor in possession can modify retiree benefits"
What does this mean in the context of this situation? Additionally, can you clarify what makes you think the 8.25% bonds are ahead of any claims? Another issue that is related to your point about a possible sale of assets from entities that don't have OPEB claims is marshaling (i.e. which entities do the DIP and other secured, admin and other priority claims recover from). Obviously the OPEB creditors and other GUCs will have an incentive to argue that the DIP etc should look first to the entities that they don't have claims against, while the bonds will argue that the DIP etc should look to recover from the entities that the bonds share with other creditors and not look to the entities that the bonds have to themselves. My understanding is that a secured creditor cannot be forced to marshal (ie look to specific entities in a specific order for its recovery, even if that will provide a 100 cent recovery), but would be interested in hearing your legal writers' view on that as well. I think the biggest thing on every shareholder's mind is WHAT IS GOING TO HAPPEN TO THEIR STOCK? Do you think it will remain intact? April figures say that a massive number of the shares are (were) held by BIG Institutions. A person has to think they will be twisting arms to make sure current stock is THE stock the PCX "stays with" after the BK is over. The stock will likely be worth zero and shares will be cancelled, as is the case in most bankruptcies and is mentioned on Patriot's site.